Remember when I shared with you my review of the NEW Silhouette Cameo Machine here? And I shared with you how much I love it? Well, today…I get to give ONE lucky Idea Room Reader their very own Silhouette Cameo Machine. Someone is going to get their chance at a second Christmas! 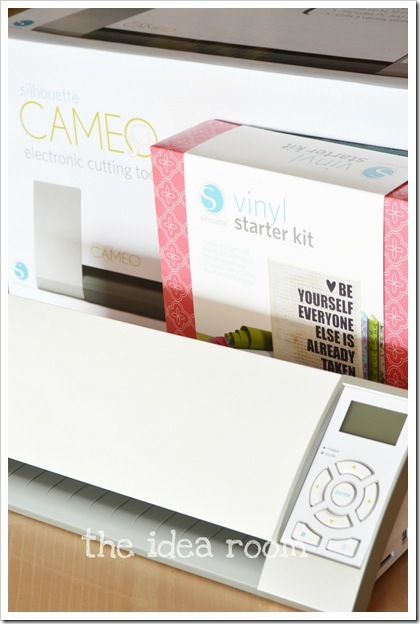 The Silhouette CAMEO™ is an electronic cutting tool that connects to your computer allowing you to cut fonts and images in cardstock, vinyl, heat transfer material, etc. And…The Silhouette can be used to create scrapbooks, cards, home decor, custom apparel, school projects, glass etched projects, stencils, and so much more. 1. Like Silhouette on Facebook. Come back and leave a comment here letting us know. This giveaway will close on Tuesday, January 3rd, 2012 at 2:00 pm MT. The winner will be announced back here later on January 3rd, 2012. 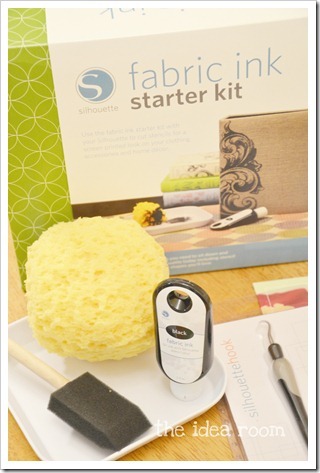 Using my code will get you the Silhouette Cameo and a Fabric Ink Starter Kit for $299. The codes will be valid from the 29th of December through the 5th of January, but you will need to order one quickly as the number of Cameo’s available for this promotion are limited. If you do use the IDEAROOM promo code you will need to add a Silhouette CAMEO and a Fabric Ink Starter Kit to their cart (separately) and then enter the promo code. If you already have a Silhouette CAMEO and just want a Fabric Ink Starter Kit or any fabric ink supplies, you can use the code IDEAROOM and get a 20% discount just for those select items. Want to increase your chances of winning? Check out all these other sites who are also giving away a Cameo this week! *This is a sponsored conversation written by me on behalf of Silhouette CAMEO. However, the opinions and text are all mine. Contest runs December 29-January 3, 2012. Are you kidding? I would LOVE to win at Cameo. Thanks for the chance. Yeah! If my google reader counts, I follow the Idea Room there! Pick me! Pick me! Please! I just ordered one, but I know plenty of friends that would love this! I would love the cameo! I’m a follower of The Idea Room, and I would *love* to win a Cameo!!! I hope I win! I really want one!!! FINGERS CROSSED! This would be AMAZING to win!!! I liked Silhouette on Facebook!! Following The Idea Room on GFC!! OMG! I would love to win! It was on my Christmas list… and I never got it… I will be keeping as many things crossed as possible! The Cameo looks awesome. Would love to have one! Thank you for the opportunity to win this goodie. I’ve had my eye on one for some time now. I want the new Cameo so bad!!!! I have been dying for one of these for awhile now! What a generous giveaway! It looks like so much fun! I’d love to win this amazing prize! I would loveeeeeee to win this!! Thanks for such a great giveaway! I wanted to tell you I love the top of your page! Love those lightbulbs!!! Thanks for a chance to win a Cameo! I would have so much fun with one of these! i would love to win this so I have something to do while the guys watch Swamp People! I get you in my rss feed! I’m a follower of the idea room already. and I’m a follower of The Idea Room. I follow IR on google reader. I would love love love to win this! I’ve wanted one so bad! I would LOVE a second Christmas!!!!! AND i followed silhouette on pinterest!!! Not only did Santa NOT bring me my beloved Silhouette Cameo for Christmas, he brought me a cold! I would have much preferred a piece of coal! But, I’m excited to find you are giving a Cameo away. There is hope. Yes, I might be able to do some cool decorations next year, make some fun gifts, plus, I’ve already bought supplies to do etching and I’m sure the Cameo would help me do a great job at it. I don’t just like Silhouette on Facebook, I stalk them. I’m new to Pinterest, but happy to now be following Silhouette there too. OOOOOO…I hope I win. Pick me pick me. I’d love a second Christmas, if I could be so lucky!! A friend of mine showed this to me and I really want one!! I would LOVE to win a Silhouette! I just spent time with my MIL making tons of fun things on hers… I want one!!! Would love to win this wonderful machine! Have some real scrapbooking envy here. Being the crafty girl I am, I would be jumping for joy if I won this! Thanks for the chance! I am a follower of the Idea Room. Thanks for the chance to win. I am a Silhouette Facebook follower! I follow this amazing blog! Thank you for this awesome opportunity!! Sounds awesome I’d love to win!! I follow Silhouette America on Pinterest. I follow The Idea Room on GFC. Can I just say what an amazing giveaway this is? Really, really love it! I follow them on Pinterest as well. I folow the idea room via Google Friend Connect too! O I love! I love! I would love one! Thanks for the opportunity! I am following TIR already! I shared this giveaway on FB. I liked Silhouette on FB. I started following thenm on Pinterest and I tweeted the giveaway! I would love one! Love the cameo and would love to own one! Thanks for posting this contest on your blog. Thanks fr having such a fabulous giveaway! I would love to win it! Love your website! Would LOVE a Silhouette too! Ahhh I would love this!!! I follow you thru google reader! What an awesome giveaway! I love your blog and especially love all the kid ideas you post. You are so talented! Thanks for the chance to win! What the perfect gift to start the New Year! I would **LOVE** one!!! Just found your blog through Pinterest and did your Key Fob tutorial! Can’t wait to go through the rest of your blog! I’m following you on Google Friend Connect! What a great way to start the new year! Will it help my chances if I act lIke my 1 year old…”me me me!”? Oh, my, I’d totally love to win this. I follow the Idea Room. It would be so great to win the Silhouette! I want one but our starving college student years are far from over! :/ Finger’s crossed!! I am now following silhouette on pinterest. Just for you. I wish! I wish! I wish! Also, you have some of the coolest ideas on your blog. I love the chalk paint and it is so easy to make. I have 4 kids and you have the best ideas for making me a better mom! Thanks for taking the time to share your ideas and talents! I follow The Idea Room on blogger! I believe I’m now following the idea room’s rss feed (if I did it right). My birthday is Dec 31st and this would make the best birthday present for this pregnant mommy with 3 girls who loves to be crafty!!!!! I follow the idea room! You rock! Oh, how I really, really want a Cameo! I’m a follower of this blog. What an amazing giveaway! THANK YOU THANK YOU THANK YOU!!! Would love to win this awesome machin. Fingers crossed hope I do. These things look so fun! I would love to have one. I am dying to get one these!! i would <3 one of these!!! What an awesome giveaway! I could so use one of these! Thank you for the opportunity! I read your blog using Google Reader. i follow like them on facebook! I follow on facebook! Thanks for the chance to WIN! I want one solo bad! I really really really want to win this, since I begged santa for one, but he did not bring one. I have been a follower of the idea room for a long time, love this blog! Someone’s gotta win….May as well be me, right??? What an awesome giveaway! I’d love to win this! Hey-ho, Good luck to all commentators, this would be a fabulous prize to win! I never win these things… but there could always be a first time! I follow Silhouette o Pinterest!!! I’ve been RSSing The idea room since I first found it! I really really want a Cameo. It was on my Xmas list but Santa did not bring me one. :( thank you for the chance to win. Liked Silhouette on FB and am crossing fingers and toes. Follow Silhouette on Pinterest and am crossing fingers and toes. Follow the Idea Room and am crossing fingers and toes. Thanks to you and thanks to Silhouette for this giveaway!!! I would love a Cameo. I was hoping Santa would leave it under the tree… But no luck! I follow Silhouette on FB! How exciting!! Thanks for the awesome giveaway! Thank you for hosting! I have wanted one of these for so long, the ideas just keep spinning in my head! It would be nice to create them instead of just dreaming! I was actually just thinking if I should upgrade my silhouette! Thanks for the opportunity! I’d love a silhouette cameo!! love this great giveaway! thanks for the chance to win! I follow The Idea Room by email. I’ve never had a second Christmas in one year but there would be one huge celebration at my house if I were to win a Silhouette Cameo. Come on Santa, another visit for me, please! What a great way to start the new year — with my hopes high that I won’t have to wait until next Christmas for a Cameo. Thanks for hosting this great giveaway. I follow Silhouette on Pinterest. Isn’t Pinterest the best thing since sliced bread! Thanks for offering a chance to win this! I follow The Idea Room by email and I’ve just added it to my Google Friend Connect account. I don’t want to miss out on a single great idea! Yay! Following Silhouette on Pinterest and Idea Room with google reader! I follow The Idea Room! Awesome giveaway! And I would simply LOVE to win a CAMEO … oh the projects I could make!! What a fantastic giveaway! Thanks for lining it up!! I follow Silouhette on Facebook. The Cameo is awesome!! Would love to win one!! What a wonderful giveaway, thank you for the chance to win! I would love to own a silhouette as demonstrated o n here!! I am a Silhouette Facebook fan. I am a Silhouette Pinterest follower. I want to make some twin onesies for my baby boys! I follow Silhouette on Pinterest.. and get lots of ideas I drool over! I was sooo jealous when my sister in law opened up a new Silhouette for Christmas – I’d love one of my own! Iwas so jealous when my best friend’s husband had a Cameo shipped here for Christmas as a surprise to her. I would LOVE LOVE LOVE a Cameo! I’m following on Pinterest – now I’ll REALLY be addicted over there! I follow the Idea Room on RSS feed. I am wishing that I could win a Silhouette. It’s probably not going to happen for me, but what an amazing giveaway! I am happy for the winner! Pick me! I want to win!!! I follow Silhouette on Pinterest now. Oh dear, that might not be a very good thing for my checking account! I want to do all those amazing projects! Keeping my fingers and toes crossed to win a Sihouette!!! Already a fan of Silhouette on Facebook! This was on my Christmas list, but Santa did not deliver. :( Thanks for the opportunity to win one! Following The Idea Room in Google REader! Thanls so much for doing this giveaway. I would LOVE to win this. Wow! What a great giveaway! i would LOVE to win the Cameo!! I follow Idea room through email and Silhouette on FB. Love what you can create with this machine! Also, just discovered Pinterest earlier this week and LOVE it!! I lose hours looking though all the fun ideas. I am a fan on facebook of silhouette. I’d love to win the cameo!!!!! great giveaway!!! Lastly, I really would love this like every other person here and I do follow Idea Room through RSS feed. Now to my any comment. I love following your blog. I have used so many of your ideas. Thanks for taking the time. I know blogging takes a lot of time. Here is my comment with fingers crossed! I follow the idea room with Google reader-does that count? I would so enjoy one of these!!! This is a great giveaway. Thanks for the chance to win. Would LOVE to win. Thanks and Happy New Year! I also like silhouette on Facebook and pinned on pinterest! Me, Me, Me pick me! :) I would love to win a Silhouette! I follow on Facebook and am heading to Pinterest. I so need to win this awesome machine!!! Pick me! Oh, I so want a Silhouette! Pick me, Pick me!!!! Oh do I hope I am the lucky winner! I am an email subscriber-follower. So incredibly excited for this give away! I WOULD LOVE TO WIN ONE OF THESE MACHINES!! To think of all the endless possibilities of projects you can make with one! It’d be awesome to own! I follow Silhouette blog on pinterest. I would love to win because I like the idea of creating my own designs… love it!!! I’ll like you forever, I’ll love you for always. If I win the cameo, my favorite blogger you’ll be! I am following on Pintrest! I would love to win one because I love to make things for people and this little machine makes me look like a hero. I have wanted one of these for a LONG time! Hoping I win one to start working on my to – do list! I want this so bad! Thanks for the chance to win! I am now a follower of this blog thru Google reader!! :) Thanks so much! I follow Sihlouette on FB! I love the ideas I find on this blog through Google Reader! How awesome it would be to win. I liked them on Facebook and get your blog posts in my email daily. I would follow them on Pinterest if I was signed up there but have been resisting Pinterest so hard but I’m thinking I need an invite! ugh!! lol Happy New Year to you! I follow Silhouette on Pinterest and FB….I also signed up to receive your emails((: Thanks for the offer!! Man, I wanna win this so bad!!! And of course I follow on RSS! Here’s hoping I’m the luckiest gal!!! I like Silhouette on FB!!! I have been so impressed with all the Silhouette can do!! Definitely on my wishlist! I wanted one of these for Christmas but I knew I wouldn’t probably get one. This would be a fun after Christmas gift. I have so many ideas for one! Thanks! What a way to start 2012 – a chance to play. would love, love, love to win this!!!!! Following the Silhouette on Pinterest…so many cool project ideas!! Liked Silhouette on facebook–it’s everywhere!! i already like silhouette on facebook! & would love to win one. I’m all for a 2nd Christmas :) Thanks for the chance to win! i finally have a pinterest account! yeah. now i like silhouettte on P.
Wow, it look like it would be a lot of fun. Pick me! Pick me!! I would love to win! i subscribe to idearoom. very inspirational! I love that the Silhouette is so versatile when it comes to crafting and I’ve been wanting one to try out the glass etching. Thanks for hosting a great giveaway! I follow (and love) the idea room. Winning a Silhouette Cameo would certainly put the ‘happy’ in my new year! Thanks for offering this awesome chance to win one! WOW — winning the Silhouette would be an AWESOME start to the NEW Year!!! I would love to win this cameo!!! What a way to start the New Year!! I would love a Cameo. I already have so many fabric projects in mind to use it with! I already follow them on pinterest and I am going to check now and make sure I am a fb fan. I am an Idea Room RSS follower. Love your blog – and this giveaway! I am a The Idea Room follower! I follow Silhouette on Pinteres! I would love to try this out! I’m already thinking about all of the projects I could make with it! I follow the idea room via Google! I would love to own one of these! Thanks for the giveaway! I’m following Silhouette on Facebook. Oh, pleeaaaaase pick my post. I want to win soooooo badly! SIGN ME UP! PICK ME, PICK ME! I would LOVE to have a Cameo!! Thanks for the chance!! I would looooove to have one!!!! Like everyone else that can breath, I would really love to win this! Oh, me, me! Pick me! Pretty please, with sugar on top? A second chance? yes please! Thanks so much! I would LOVE to be your winner! I already “like” and “follow” Silhouette AND you! Love following you by the way. I didn’t get one for Christmas. I all ready subscribe to The Idea Room in my Google Reader! Id really like to win! There have been several instances over the past year where I really wished I had one. Just found your blog. Thanks for a great giveaway. Thanks so much for the chance to win a Silhouette! I am feeling lucky! I am now following you with google connect. I subscribe to The Idea Room via email. I crossing my fingers! Thanks! I follow Silhouette on Facebook as well! I have liked Silhouette on facebook. I am now following Silhouette on Facebook! I am new to your blog and it’s fantastic! I would love one :) This is a great giveaway. Thanks for hosting! I am now following Silhouette on Pinterest! WOW, there are tons of great ideas there! thanks! I follow The Idea room on Google Reader (does that count?)! I would LOVE, LOVE, LOVE to win this machine!!!!! It would be the best after Christmas gift ever!!! I follow The Idea Room – and love it!! I would lve to be entered! Thanks for hosting! I am an Idea Room’s Google Friend Connect member! I would love to win this for my wife. It would be an awesome birthday present for her, something I would never be able to afford on my own. Would love to win the silhouette cameo!! Wow! This is such a nice gift! Thanks for the opportunity to win! I want one of these so bad! Crossing my fingers! After being limited on my current machine, would love to start the New Year with a New machine that would be able to let me create and design not from a cartridge!! Have so been wanting to be apart of the Silhouette Family!! I follow the Idea Room’s Rss! Thanks for the chance to win! i follow you on RSS! i want to win, i want to win! please let me be the random winner! I follow idea room on rss feed. I am a Google Connect friend!! I follow Silhouette on FB!! I would love to win one of these!!!! I love following Silhouette on Pintrest!! I would love to win a Cameo. pick me! Love your ideas and love the chance to win!! Thanks. I would love to win this. Thank you for the chance. Love this!! O how I would love to have a 2nd Christmas!! Thanks for the chance to win! I know I wont, but hey here is to trying!!! I have been wanting on of these forever! I ask for it for Christmas but didn’t get it :( Man I hope I win! Good Luck to everyone! I ‘liked’ Silhouette on Facebook! I like Silhouette on FB too! I sub to y’all thru Google reader. I follow The Idea Room via e-mail feed. You are one of my very favorites! I’m jealous, and I really, REALLY want one of these! Oooooh, I’d love, LOVE one of these! I would love a chance to play with one of these!! I follow Silhouette on FB!!! I already stalk Silhouette on Pinterest! I follow The Idea Room too!! I look for ward to the emails of your new posts! I also follow Silhouette on Pinterest! Sooooo many cool ideas! I Foloow the Idea Room! Please enter me in this wonderful giveaway. I am a follower and would love to own one of these great machines! I am signed up to follow The Idea Room on RSS too! I Follow silhouette on pimterest!